It’s a strange truism that it’s quite difficult to learn something unless you have someone teach it to you. So it goes without saying that learning to fly is going to require me to choose a school. Let me state at the outset that the school where I did my initial flight impressed me. They are enthusiastic, seemed to be quite well organised and have a number of aircraft. However, there are some disadvantages to learning to fly in Bronkhorstspruit. Firstly, it is A. LONG. WAY. AWAY. 95km door to door requiring me to drive on one of the busiest highways in the country where accidents and heavy delays are a daily occurrence. Early on a Saturday morning it took 70min to get there. 70min to get back. Add to that an hour briefing, hour flight, hour debrief and it looks like a whole morning to get an hour of flying in. Secondly, there is no controlled airspace out there (unless you climb above 7500′ in which case ORTIA ATC tend to get a bit annoyed apparently) – so when/if I eventually transition to busier airspace dealing with other aircraft and ATC in controlled situations may be difficult. On the plus side, they are nominally cheaper, but as I later became aware, their hourly rate didn’t include insurance. Add to that 140km wear and tear on the car and it isn’t looking that cheap any more. So I thought I’d look at something a little closer to home. I asked around for some recommendations – I have a colleague learning at FAGC – they are VERY expensive – operating C172s. 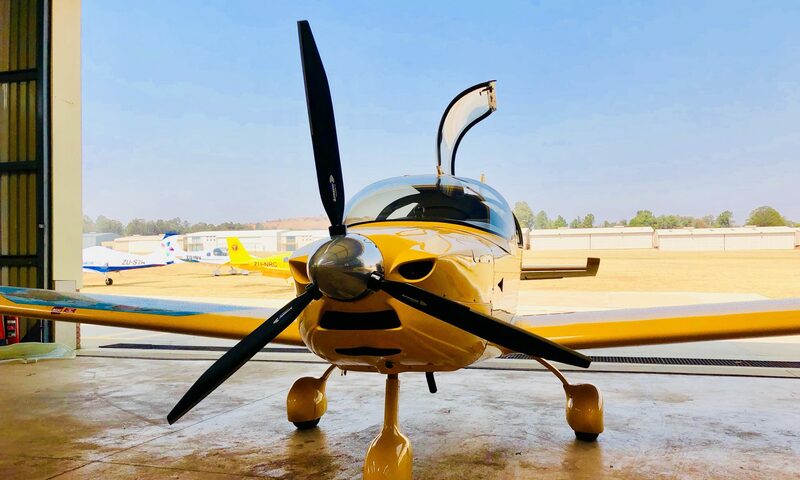 Another contact suggested 43airschool – which turns out doesn’t have a branch in Jhb for ab intitio training – they put me onto Cirrus Flight Training (CDC Aviation) at Lanseria. Now THIS is a pro outfit. I went out to have a look and have a demo flight and was taken round by Nick, one of the guys working his way through the CPL. They seem very organised – have a fancy system for flight booking, have onsite Cirrus maintenance and have 5 aircraft for training all SR20’s some equipped with the Avidyne Entegra and some with the Garmin Perpective avionics. There seems to be a strong culture of safety in the organization which is appreciated – especially as I get older I’m becoming more acquainted with my mortality. Did I mention they train in the Cirrus? They hooked me up with an instructor and we set off to preflight the aircraft – ZS-BOR. Michelle gave me a quick briefing and then took me round the preflight – more on that in another post. It was time to fly! There is a lot to say about the Cirrus which I hope to explore in other posts as I make progress – suffice it to say that it is a beast of an airplane. You really feel connected to it – the side stick feels natural for a long time computer flight simmer, and the performance is not too shabby….. So there it is – I will be doing my training on the sleek Cirrus at CDC. Lots of hoops to jump through but we’re on our way! I’ve wanted to fly for as long as I can remember. Poor vision and an aptitude test suggesting flying would be a bad career for me put paid to those aspirations. 24y later, with a successful anaesthetic practice, I’m ready to get going on this flying thing. My friends and family clubbed together to buy me an introduction flight for my 40th. Through a combination of being extremely busy and poor weather it took almost a year to get it done. On the appointed day, we headed out to Bronkhorstspruit to a tiny airfield where we were met by the very enthusiastic team. A quick briefing and we were off in a Tecnam Sierra which is classified as a Light Sport Aircraft (LSA) – what an experience! I was amazed at how light the controls were – it seemed that all I had to do was think about turning and the aircraft would bank. It was a beautiful day for flying – crystal clear skies and too early for much in the way of bumps and unstable air. No takeoff or landing for me on this flight but that’s ok – it was enough for a first time. An hour of buzzing around the Far East Rand – over Bronkhorstpruit Dam and Cullinan and my fate was sealed – this was something I had to do. If anyone thought this would cure me they were wrong….